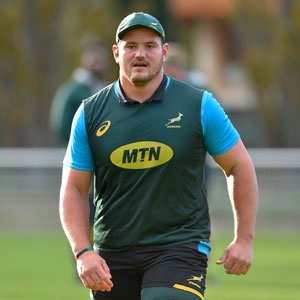 Cape Town - Springbok tighthead prop Wilco Louw says it’s more of a challenge to scrum in northern hemisphere conditions. Louw made his Test debut when he came off the bench against the All Blacks at Newlands last month and featured in both of South Africa's first two Tests on their year-end European tour. He replaced Coenie Oosthuizen early in the 38-3 loss to Ireland in Dublin and started in last weekend’s 18-17 win over France in Paris. The 23-year-old addressed reporters in Padua on Tuesday as the Springboks prepared for this weekend’s Test against Italy. According to Louw, scrummaging in the northern hemisphere is different to what he’s used to back home. “The scrums here are a bit more of a challenge. It’s a bit longer, there’s much more pressure because you’re scrumming against a guy that has played 50 or 60 Tests,” he said. The Springboks trained at high intensity on Tuesday, with assistant coach Matt Proudfoot revealing that they opted for a “live scrummaging session” because “the scrum machine and field surface were perhaps not the best”. Louw agreed that the live scrummaging session was better compared to a scrum machine. “I think you can ask a lot of props, the hardest scrums take place in practice because during practice you have a go at each other because you don’t know what lies in wait on the weekend. The harder I have a go at a loosehead and the harder a loosehead has a go at me, the better it makes me at the end of the day,” he said.